Google Street View, a feature of Google Maps that allows users to zoom into a location and peruse it in a 3D environment, has already mapped over 100 cities around the world with street-level shots taken with with a car-mounted camera. 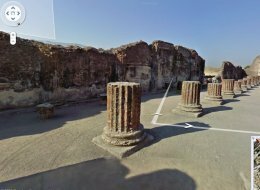 As part of its effort to move beyond roads, and map, in 3D, amusement parks, college campuses, and hiking trails, Google Street View has just added incredible, interactive panoramas of the ancient ruins of Pompeii. Meander through the ancient columns, inspect the worn rock, and clamber around the historic site on Google here. If that doesn't give you your fix of historic sightseeing, check out Google Street View's interactive view of Stonhenge, or for something totally different, see the Street View shots of Shamu, leaping dolphins, and more from SeaWorld. Learn more about Street View from Google here, and get the full story about the Google Trike used to snap photos of off-road spots here.